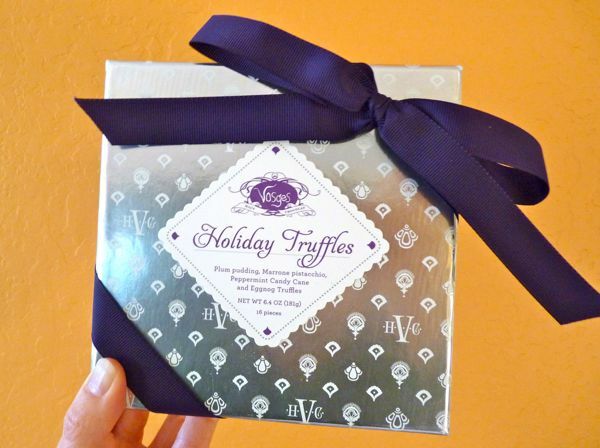 Today I jumped off the chocolate and candy cane theme week bandwagon, but stayed in the holiday spirit with these two truffles plucked from a Vosges (Chicago, IL) assortment box. The Eggnog truffle (probably my favorite of the two) contained Appleton Estate Rum, Grenadian nutmeg, ginger, and Dominican Republic white chocolate. While this smooth, pretty holiday sweet lacked the cocoa solids to meet my definition of "real" chocolate, it was nice to try something different. The rum and very subtle spice blend made for a nice overall eggnog-inspired flavor. 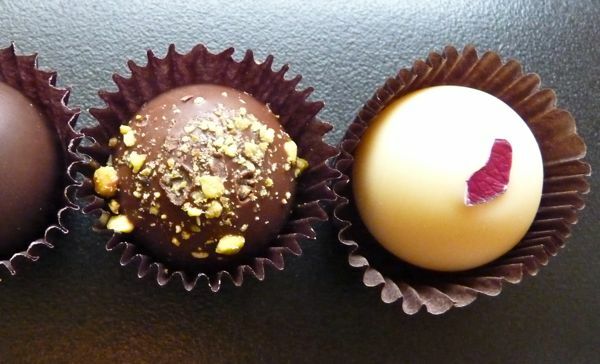 The Vosges Marrone Pistachio truffle was made with Italian Chestnuts, Sicilian Pistachios and 45% cacao deep milk chocolate. Like so many Vosges chocolates with colorful origin stories, it sounded like there was some helpful field research behind this one. I don't recall sampling many chocolates that incorporate the subtle flavor and interesting texture of chestnuts, so this was a treat.